PITNEY, Mahlon, a Representative from New Jersey; born in Morristown, Morris County, N.J., February 5, 1858; attended the public schools; was graduated from Princeton College in 1879; studied law; was admitted to the bar in June 1882 and practiced in Dover and Morristown, N.J., 1882-1889; elected as a Republican to the Fifty-fourth and Fifty-fifth Congresses and served from March 4, 1895, to January 10, 1899, when he resigned; member of the State senate 1899-1901 and its president in 1901; associate justice of the supreme court of New Jersey 1901-1908; chancellor of New Jersey from 1908 to 1912, when he resigned; appointed by President Taft as an Associate Justice of the Supreme Court of the United States February 19, 1912, and took the oath of office March 18, 1912; served until December 31, 1922, when he resigned; died in Washington, D.C., December 9, 1924; interment in Evergreen Cemetery, Morristown, N.J.
Papers: In the Miscellaneous Manuscripts Collection, 1664-1956, 10 linear feet. Correspondents include Mahlon Pitney. Papers: In the John O. H. Pitney Papers, 1901-1927, 1 volume and 1 folder. Correspondents include Mahlon Pitney. Papers: In the John O. H. Pitney Family Scrapbook, 1907-1927, 1 volume. Persons represented include Mahlon Pitney. 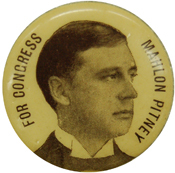 Pitney, Mahlon. Alaskan Boundary: Remarks of Hon. Mahlon Pitney, of New Jersey, in the House of Representatives, Wednesday, February 12, 1896. Washington: N.p., 1896.